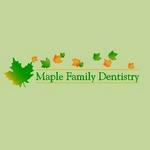 Maple Family Dentistry is a family, cosmetic, and implant dental practice in Maple, Ontario. Dr. Zhu is the founder and owner of Maple Family Dentistry. Maple dental practice offers many dental services to fulfill their commitment of providing the highest standard of dental care. Products Carried: Maple Family Dentistry offers general, cosmetic, and dental implant services. Located in Maple, Ontario, Dr. Zhu and his dental team offer such dental services as: General Dentistry, Cosmetic Dentistry, and Pediatric Dentistry. They also offer Implant Dentistry, Oral-Maxillofacial Surgery, Laser Dentistry, and more. Maple Family Dentistry strives to provide superior dental health care while creating lasting relationships with each patient.